Mariano Rivera was elected to the Hall of Fame, the first player ever to appear on every single ballot. Why has this never happened? Because there are a lot of ballots and thus a lot of opportunities for glitchy idiosyncrasy. In 2007, eight voters left Cal Ripken, Jr. off. What possible justification could there be? Paul Ladewski of Chicago’s Daily Southtown was one of the eight. 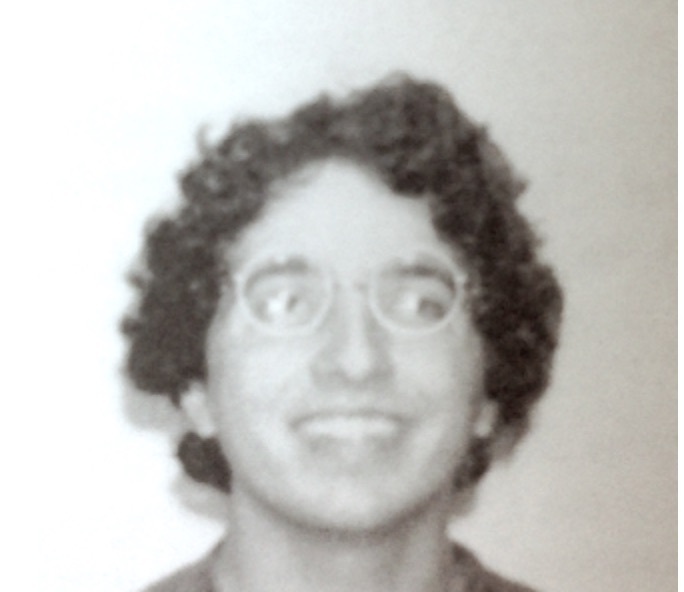 He turned in a blank ballot that year. He said he wouldn’t vote for anyone tainted by playing during the “Steroids Era.” In 2010, he voted for Roberto Alomar. This all started when CJ asked which three baseball stadiums formed the smallest triangle. And we agreed it had to be the Brewers, the White Sox, and the Cubs, because Milwaukee and Chicago are really close together. But it seems like cheating to use two teams in the same city. The most elegant way to forbid that is to ask the question one league at a time. Which three American League parks form the smallest triangle? And what about the National League? First of all, what does “smallest” mean? There are lots of choices, but (perhaps inspired by the summer we played a lot of Ingress) we asked for the triangle with the smallest area. Which means you don’t just want the parks to be close together, you want them to be almost collinear! I asked on Twitter and got lots of proposed answers. But it wasn’t obvious to me which, if any, were right, so I worked it out myself! Seamheads has the longitude and latitude of every major league ballpark past and present in a nice .csv file. How do you compute the area of a spherical triangle given longitudes and latitudes? You probably already know that the area is given by the excess over pi of the sum of the angles. But then you gotta look up a formula for the angles. Or another way: Distance on the sphere is standard, and then it turns out that there’s a spherical Heron formula for the area of a spherical triangle given its edgelengths! I guess it’s clear there’s some formula like that, but it’s cool how Heron-like it looks. Fifteen lines of Python and you’re ready to go! 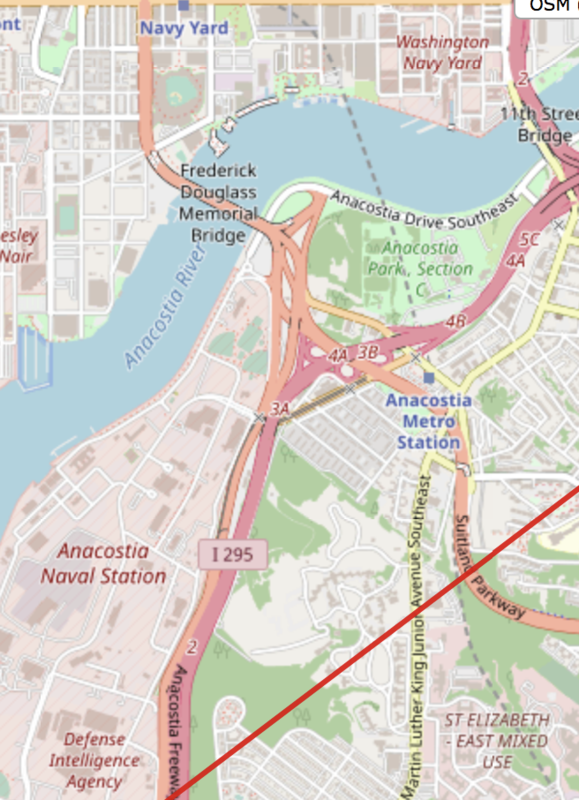 Not only does it go right through DC, it passes about a mile and a half from Nationals Park! 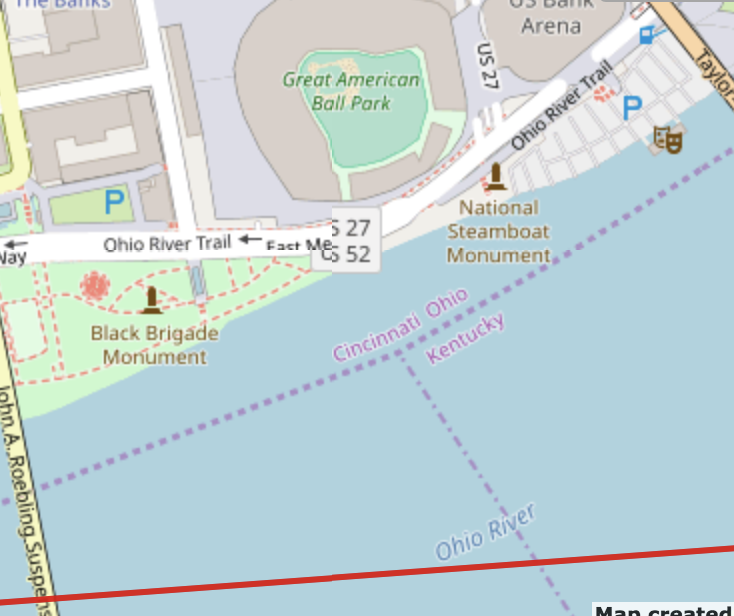 The geodesic path runs through the Ohio River, about 300m from the uppermost bleachers at Great American Ball Park. Wow! Now here’s a question: should we find it surprising that the smallest triangles involve teams that are pretty far from each other? If points are placed at random in a circle (which baseball teams are definitely not) do we expect the smallest-area triangles to have small diameter, or do we expect them to be long and skinny? It’s the latter! See this paper: “On Smallest Triangles,” by Grimmet and Janson. Put down n points at random in the unit circle; the smallest-area triangle will typically have area on order 1/n^3, but will have diameter on order 1. Should that have been what I expected? PS: the largest-area major league triangle is Boston-Miami-SF. Until MLB expands to Mexico City, that is! After game 2 it was already clear this was an NLCS so great it had to go seven, and it did. But game seven wasn’t a great game seven. After six hard-fought games, the Brewers never really mounted a threat, and went down 5-1. Keenest pain of all was that I got what I’d been waiting for the whole series; a chance for my beloved Jonathan Schoop to be the hero. He came in to pinch hit for starter Joulys Chacin in the bottom of the second, with two on and two out and the Brewers down by 1. Schoop grounded out. He was 0 for the postseason in 6 plate appearances. The greatest Red Sox / Dodger? A player I’d never heard of, even though he was just a little before my time: Reggie Smith. Played in one World Series for the Red Sox (1967) and three for the Dodgers (1977,1978,1981). Went to the All-Star Game with both teams. Hit 300 home runs, cannon of an arm in the outfield, got 0.7% of the vote the one and only time he was up for the Hall of Fame. Well, here’s his all time distinction; with 34.2 WAR for the Red Sox and 19.4 for the Dodgers, he’s the greatest Red Sox / Dodger of all time. Surprisingly, given how old these teams are, the top Red Sox / Dodgers of all time are mostly recent players. Derek Lowe is the top pitcher (19.4 WAR for Boston, 13.3 for LA.) Adrian Gonzalez, Manny Ramirez, and Adrian Beltre are also worthy of mention. The only old-time player who was a contender was Dutch Leonard, who actually pitched for Boston in the last Red Sox – Dodgers World Series in 1916, notching a complete game win. But that guy never actually pitched for the Dodgers! My search got confused because it turns out there were two Dutch Leonards, the second of whom was a Dodger to start his career. Doesn’t count! In 35 years of watching baseball I had never been to a postseason game, until this Saturday, when I was able to get two tickets to Game 2 of the National League Championship Series through a wonderful terrific beautiful friend with connections. 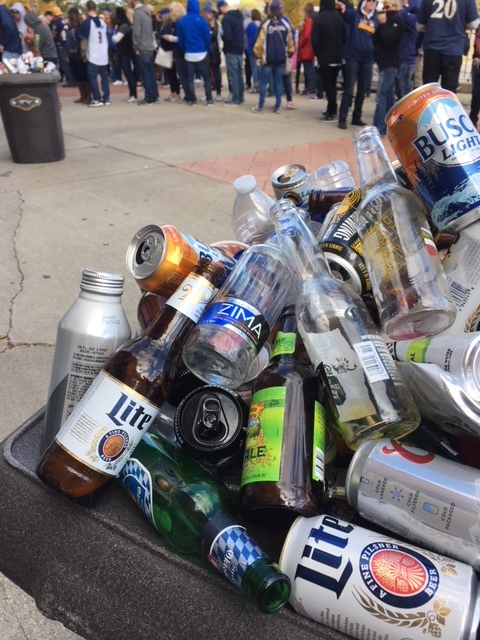 First of all, I salute whoever the free spirit was who slammed a Zima right before entering Miller Park. 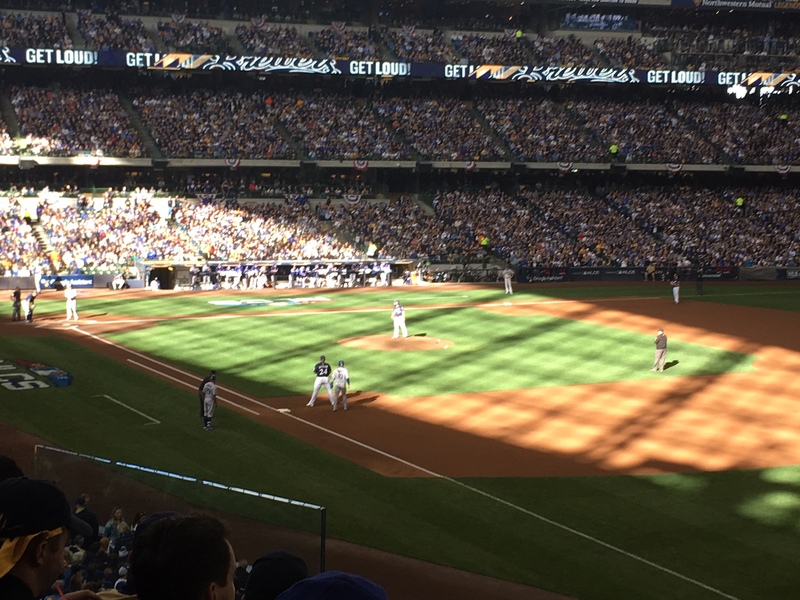 The game started at 3pm; in late afternoon with the roof shut at Miller Park there’s a slant-line of sunlight across the field which is lovely to look at and probably terrible to hit in. And indeed there wasn’t a lot of hitting to start with. Wade Miley, once a bad Oriole, now a good Brewer, never looked dominant, giving up lots of hard-hit balls including a shot by Jeremy Freese in the first that Lorenzo Cain hauled back in from over the wall, but somehow pitched 5 2/3 only allowing 2 hits (and collecting a single himself.) Hyun-jin Ryu matched him zero for zero. Every seat in Miller Park full, everyone attentive to the game, a level of attention I’ve never seen there. The guy behind us kept saying “NASTY, throw something NASTY.” CJ believes he sees Marlins Man in the front row — he’s right! Brewers get runners on second and third with one out, Dodgers intentionally walk Yelich to load the bases, (wave of boos), Braun delivers the RBI groundout but can’t score any more. Travis Shaw hits a solo shot to deepest center, the Brewers go up 3-0, and people start to smell win, but the Dodgers lineup has good hitters all the way down to #8 and the usually reliable Milwaukee bullpen starts to crack. Jeremy Jeffress comes in with runners on first and second and nobody out, immediately gives up a single to Joc Pederson, now they’re loaded, still nobody out, Brewers up 3-1. Manny Machado, on third base, keeps jumping off the bag, trying to distract Jeffress. But Jeffress strikes out Yasiel Puig, who’s so angry he smashes his bat over his knee. Crowd exults. Then he walks light-hitting catcher Austin Barnes to force in a run. Nobody’s up in the bullpen. Crowd panics. Yasmini Grandal comes in to hit in the pitcher’s spot and Jeffress somehow gets the double play ball and is out of it. But the next inning, Jeffress stays in a little too long; Chris Taylor leads off with a lucky little dink of an infield single and then Turner muscles a ball out to the short corner in left field; 4-3 Dodgers and it stays that way. But the Brewers do threaten. 43,000 Brewers fans want to see Yelich get one more chance to be the hero. Hernan Perez draws a walk in the bottom of the ninth, steals while Cain strikes out. So Yelich gets to bat with 2 outs and a runner in scoring position. He grounds out. Crowd deflates. But that’s all you can ask of a baseball game, right? The hitter you want in the situation you want with the game on the line and whatever happens happens. Great baseball. Great team. I hope they win it all. Maybe I’ll try to be there when they do. 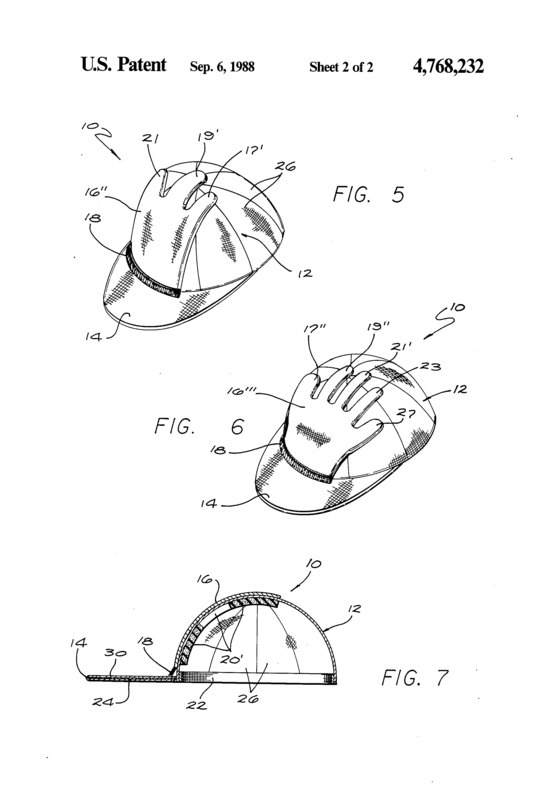 “Combined cap and baseball mitt,” A patent by Richard Villalobos, 1983. This is meant for fans, not players. The idea is that if a foul ball comes towards you, you may not have time to grab a glove you’ve stashed at your feet. Rather, you quickly slip your hand into the cap-mounted glove and snag the foul with your hat still attached to the back of your hand. I’ve lived in Madison for 13 years and this is the first time I’ve noticed anybody caring about the Milwaukee Bucks. It’s definitely the first time I’ve cared about the Milwaukee Bucks. But now the Bucks have a legitimate superstar in Giannis Antetokoumnpo and a likeable cast of supporting characters like 19-year-old former refugee and skinny blockmaster Thon Maker. The kids had a rare unscheduled day on Sunday and the Bucks were in the playoffs against the Celtics and there were nosebleed tickets on Stubhub for $40 apiece so why not? You may know that I kind of hate driving so if I’m gonna drive all the way to Milwaukee it’s got to be for more than a Bucks game. When I thought about what the kids would really want to do it was pretty clear — see the Brewers, stay over, then see the Bucks. So that’s what we did! I got lost in the impossible off-ramp spaghetti surrounding Miller Park and we ended up not getting into the ballpark until the second inning. The Brewers were already down 4-0. 4-0! To the sad Miami Marlins, the team Derek Jeter is using as a tax dodge, the team so bad Marlins Man cancelled his season tickets! But as soon as we sat down, Travis Shaw muscled a huge home run to left center. Didn’t even look like he got all of it, he kind of sliced it. But Travis Shaw is a big strong man. Brewers just keep creeping back. Crowd stays in the game, at no point do you really feel the Brewers are out of it. Three straight Brewers hit what look like go-ahead home runs but each dies at the wall. (Ryan Braun at least gets a sacrifice fly out of it.) In the 8th, Derek Dietrich loses an Eric Sogard fly ball in the, I dunno, the lights? The roof? He plays for the Marlins and he just doesn’t care? Anyway the ball plunked down right next to him, Shaw hustles in from second to tie it, Eric Thames, who starts the play on first, tries to get in behind with the go-ahead run but is tagged out at or rather substantially before the plate because Eric Thames made a bad decision. Josh Hader looks like he should be playing bass in Styx. Then comes the bottom of the 9th and the play you might have read about. Still tied 5-5. Jesus Aguilar, who’s already warmed up twice in the on-deck circle, finally gets his chance to pinch-hit against Junichi Tazawa. Gets behind 0-2. And then just starts fouling, fouling, fouling. Takes a few pitches here and there. Full count. Foul, foul, foul. And on the 13th pitch, Aguilar launches it to center field. I thought it was gonna be one more death on the warning track. But nope; ball gets out, game over, fireworks. I felt like my kids got to see true baseball. On to Milwaukee. Bucks play the Celtics at noon, in what, if they lose, could be the last ever game played at Bradley Center. (This is a bit of a sore point for UW folks, who absorbed as a budget cut the $250m state contribution to the arena’s cost.) We have breakfast at the hotel and chat with a nice older couple in Packers/Celtics gear — what? — who turn out to be Boston forward Al Horford’s aunt and uncle from Green Bay. Anyway. The atmosphere, as I have promised AB, is more intense than baseball. Bucks build up a 19-point lead and seem poised to coast but the Celtics come back, and back, and back, and finally go ahead with 52 seconds left. Jaylen Brown plainly capable of taking over a game. Aron Baynes has a very dumb-looking haircut. Milwaukee’s Thon Maker is ridiculously skinny and has very long arms. He’s just 21, a former refugee from South Sudan. We saw his first game as a Buck, an exhibition against the Mavericks at Kohl Center. Those long skinny arms can block a shot. Game tied at 102, 5 seconds left, Malcom Brogdon (called “The President” — why?) 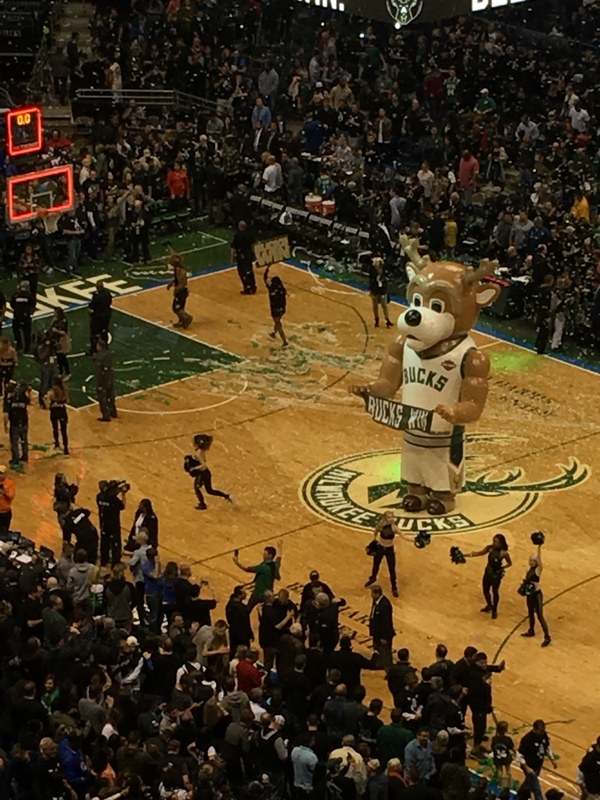 misses a layup, and there, rising like a Greek column above the scene, is the Greek arm of Giannis Antetokounmpo — the tip-in is good, Celtics miss the desperation last shot, Bucks win 104-102, crowd goes berserk. I was going to blog about this last week but got busy so let’s throw in more sports. Bucks eventually lose this series in 7, home team winning every game a la Twins-Braves 1991. The next Friday, I’m giving a talk at Maryland, and the Orioles are playing that night. 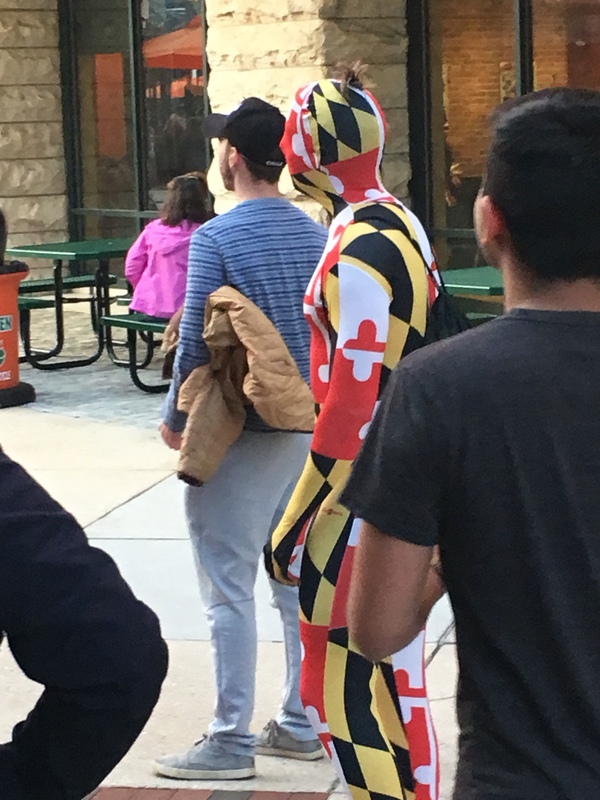 It’s been five years since I’ve seen OPACY. I brought CJ along this time, too. The Orioles are not in a good way; they’ve won 6 and lost 19, though 3 of those 6 were against New York at least. Attendance at the game, on a beautiful Friday night, was just over 14,000. The last baseball game I went to that felt this empty and mellow was the AAA Tucson Toros, several months before they moved to El Paso and became the Chihuahuas. Chris Tillman, tonight’s starter, was the Orioles’ ace five years ago. Now he’s coming off a 1-7 season and has an ERA over 9. So who would have thought he’d toss seven shutout innings and take a no-hitter into the fifth? Never looked overpowering but kept missing bats. His first win in almost a year. Manny Machado, surely now in his last year as an Oriole, strokes a home run to dead center to get things started. It’s a beautiful thing. It doesn’t even look like he’s working hard. It’s like he’s just saying “Out there. Out there is where this ball should be.” Pedro Alvarez homers twice, in exactly the opposite manner, smashing the ball with eye-popping force. Jace Peterson, who the Orioles picked up off the Yankees’ scrap heap, steals third on the shift when the Tigers third baseman forgets to pay attention to him. He did the same thing against the Rays the night before. I am already starting to love him the way I love Carlos Gomez. Maybe now the Orioles are going to go back to being a bad team that makes good use of players nobody else wants, like Melvin Mora and Rodrigo López. Never get tired of that flag. Since all the public Hall of Fame ballots are now available online in machine-readable form, thanks to Ryan Thibodeaux, I thought I’d mess around with the built-in clustering functions in sklearn and see what I could see. The natural metric on ballots is Hamming distance, I guess. I first tried the AgglomerativeClustering package. I didn’t tell it what metric to use on the ballots, but I’m assuming it’s using Hamming distance, aka Euclidean in this case. 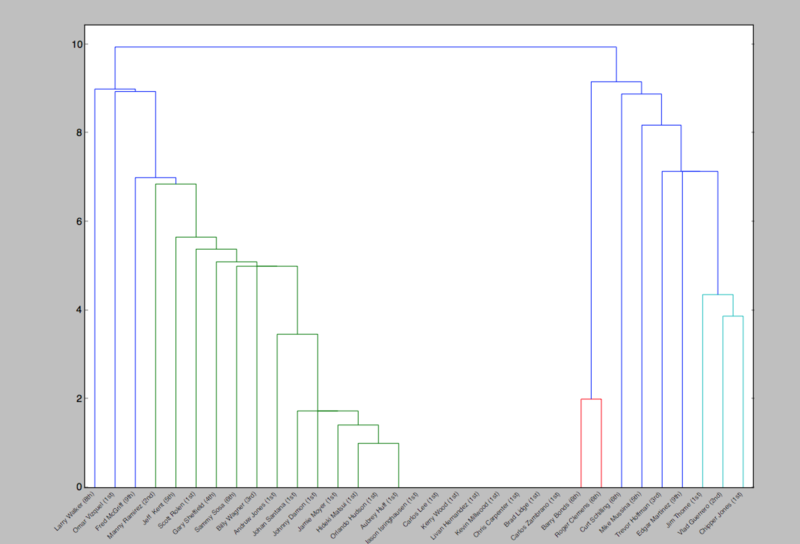 I asked AgglomerativeClustering to break the Hall of Fame voters into 2 clusters. Guess what I found? There’s a cluster of 159 voters who almost entirely voted for Barry Bonds and Roger Clemens, and a cluster of 83 who universally didn’t. You won’t be surprised to hear that those who voted for Bonds and Clemens were also a lot more likely to vote for Manny Ramirez, Sammy Sosa, and Curt Schilling than the other cluster. Which candidate was most notably unpopular among the Bonds-forgivers? That would be Omar Vizquel. He was on 53% of the steroid-rejector ballots! Only 24% of the Bonds cluster thought Omar deserved Cooperstown. Then I tried asking AgglomerativeClustering for four clusters. The 83 anti-steroids folks all stayed together. But the bigger group now split into Cluster 1 (61 ballots), Cluster 2 (46), and Cluster 3 (52). Cluster 1 is the Joe Posnanski cluster. Cluster 2 is the Nick Cafardo cluster. Cluster 3 is the Tim Kurkjian cluster. I’m not sure how to read this! My best guess is that there’s no animus towards pitchers and DHs here; if you’re voting for Bonds and Clemens and Sosa and Ramirez and the guys who basically everybody voted for, you just don’t have that many votes left. So I’d call Cluster 2 the “2000s-slugger loving cluster” and Cluster 3 everybody else. i.e. a partition of the voters into four groups. (Agglomerative clustering naturally generates a hierarchical clustering, i.e. a tree with the HoF voters on the leaves; there must be some way to get sklearn to output this directly, but I don’t know it! Not bad! You can see that Bonds and Clemens form their own little cluster in red. There is not that much structure here — maybe worth noting that this method may be dominated by the variable “number of votes received.” Still, the two stories we’ve told here do seem to have some coarse features in common: Bonds/Clemens are a cluster, and Larry Walker voting is kind of its own variable independent of the rest of the ballot. Pretty hard to read! I think that black cluster on the end is probably the no-Bonds-no-Clemens gang. But what I want you to notice is that there’s one outlying node all the way over to the left, which the clustering algorithm identifies as the weirdest ballot made public. It’s Sadiel LeBron, who voted for Clemens, Sosa, and Ramirez, but not Bonds. And also he voted for Andruw Jones and Omar Vizquel! Yeah, that’s a weird ballot. whenever voter i voted for player j but not player k. That models the idea of each player being a point in R^2 and each voter being a point in R^2 and then voters vote for every player whose dot product with them is large enough. 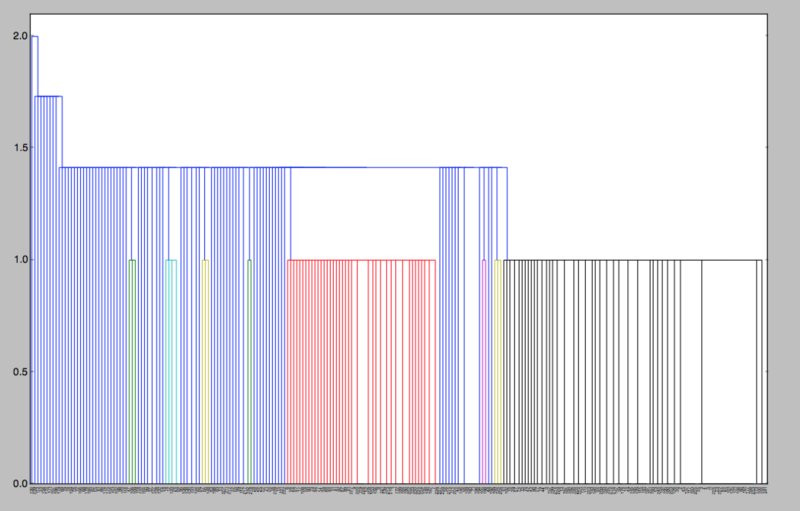 My intuition is that this would be a better way of plotting ballots in a plane than just doing PCA on the 0-1 matrix. But maybe it would come out roughly the same, who knows? Presumably there are known best practices for clustering subsets of a fixed set (or, more generally, finding good embeddings into visualizable metric spaces like the plane.) Tell me about them! The World Series is here and so it’s time again to figure out which player in the history of baseball has had the most distinguished joint record of contributions to both teams in contention for the title. (Last year: Riggs Stephenson was the greatest Cub/Indian.) Astros history just isn’t that long, so it’s a little surprising to find we come up with a really solid winner this year: Jimmy Wynn, “The Toy Cannon,” a longtime Astro who moved to LA in 1974 and had arguably his best season, finishing 5th in MVP voting and leading the Dodgers to a pennant. Real three-true-outcomes guy: led the league in walks twice and strikeouts once, and was top-10 in the National League in home runs four times in the Astrodome. Career total of 41.4 WAR for the Astros, and 12.3 for the Dodgers in just two years there. As always, thanks to the indispensable Baseball Reference Play Index for making this search possible. Other contenders: Don Sutton is clearly tops among pitchers. Sutton was the flip side of Wynn; he had just two seasons for Houston but they were pretty good. Beyond that it’s slim pickings. Jeff Kent put in some years for both teams. So did Joe Ferguson. I guess the most dominant pitching performance I’ve seen in person? Quintana never seemed dominant. The Brewers hit a lot of balls hard. But a 3-hit complete game shutout is a 3-hit complete game shutout. A lot of Cubs fans. A lot a lot. My kids both agreed there were more Cubs than Brewers fans there, in a game that probably mattered more to Milwaukee. For Cubs fans to boo Ryan Braun in Wrigley Field is OK, I guess. To come to Miller Park and boo Ryan Braun is classless. Some of those people were wearing Sammy Sosa jerseys! This is the first time I’ve sat high up in the outfield. And the view was great, as it’s been from every other seat I’ve ever occupied there. A really nice design. If only the food were better.